Welcome to video ten in the Beginner Guitar Quick-Start Series. 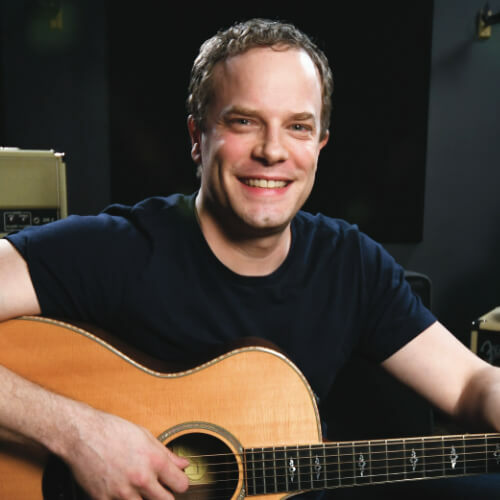 In this lesson, we’re going take everything you’ve learned about your strumming hand and fretting hand and put it together to play a classic song. This will be a lot of fun because you’ll get to take all the lessons you’ve gone through and apply them to real music. If you’re a newer guitar player, putting these things together can be challenging, so now is a good time to review any lessons on the open chords we’re using, fretting hand technique, or strumming too. All of the chords we’ve looked at so far are in the key of G major. You don’t have to worry about where that comes from for now, but it’s a good to know for future reference. We’re going to put these chords together to form a progression and play through this song. The progression is G-D-A minor 7-C. You may have trouble changing through these chords smoothly, but that’s normal at first. Spend time practicing and remember all the tips we’ve gone through for changing chords and keeping chords sounding clean. Let’s keep the strumming really simple for now so you can concentrate on making your chords changes smoothly and clearly. For now, strum each chord twice. Starting with G, strum twice with downstrokes. Switch to D, strum twice using downstrokes again, and remember not to strum the E or A string. Move to A minor 7 and leave the low E string out. Finish with C, strumming it twice as well. As you play this progression, try to visualize the chord change before it happens. When you’re playing the G chord, you should be thinking about the D chord as you strum a second time. As you play the D, think about the A minor 7, and as you play A minor 7, think about the C chord coming up. Chord Tip: If your chords sound unclear or buzzy, make sure you’re using the very tips of your fingers and coming right behind the frets. Once you start switching between new chords and chords you already know, it will become easier. It the next lesson, we’ll go over how to dress up your strumming. The tips we cover will help make your strumming more musical. If you have any questions, you can feel free to contact us.